No time for the video? Let's take a picture tour! 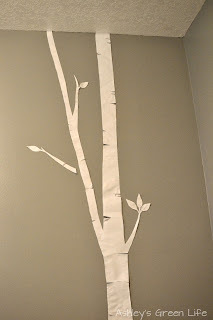 Nursery Project #1: White Birch Trees on the Wall. 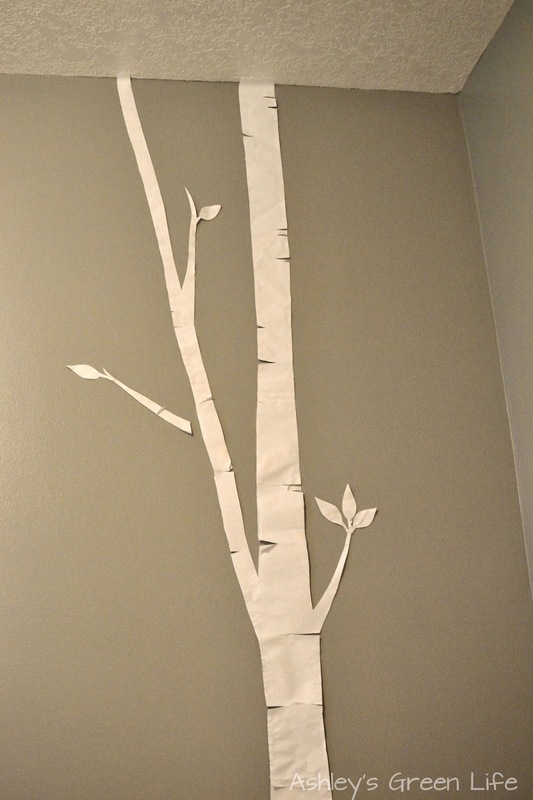 So one of the first big projects of the room was the white birch trees on the main wall of the room. 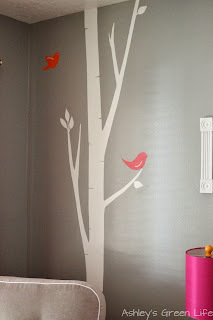 Clearly, I'm a fan of trees in baby nursery's, since I did one for Avery's room, but this time I knew I wanted to do something different. 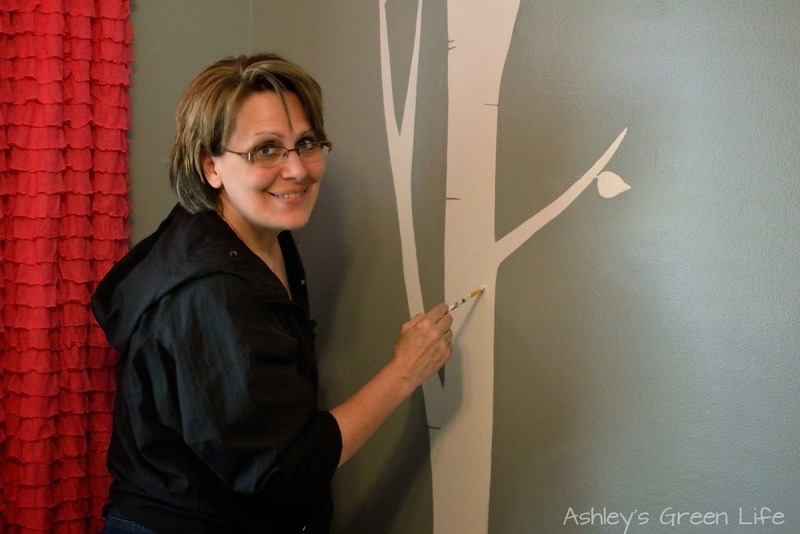 So after deciding on the design we wanted, based on this vinyl decal, my mom (and artist extraordinaire!) 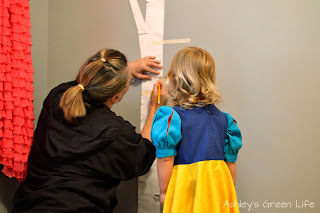 projected our version of the design on the wall and then created paper templates. help of a "Snow White Avery." 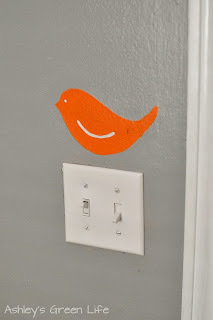 Then it was time to add some birds! placement on the wall until we got them just right. Then we painted them too! 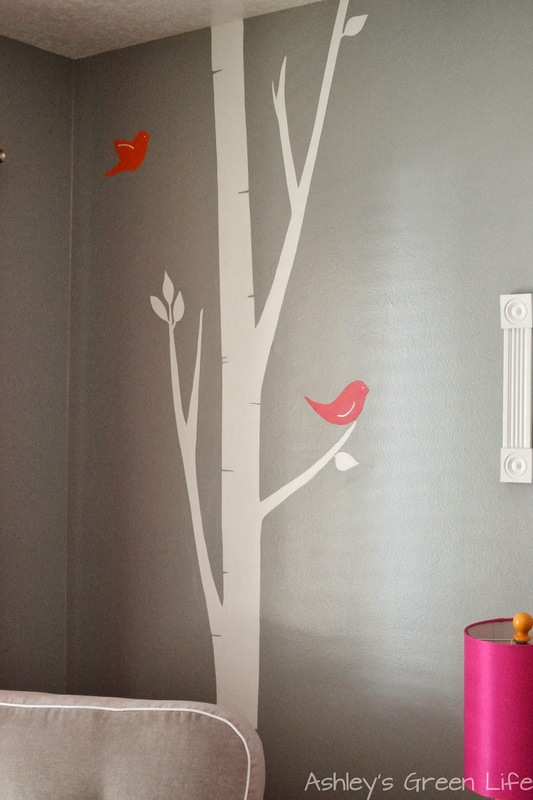 The finished birch trees and birds. 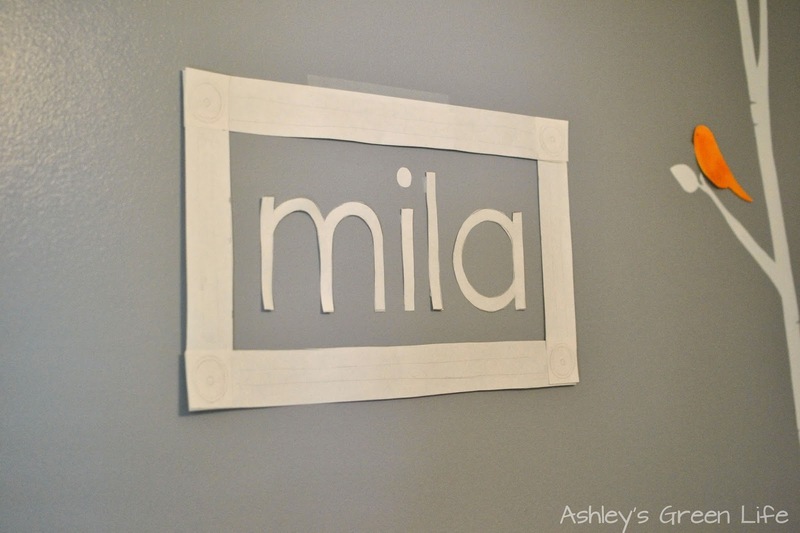 Nursery Project #2: Mila Name Frame. 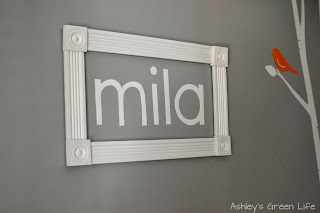 Next up on the project list was a name frame, inspired by this cool name frame I found on Pinterest. 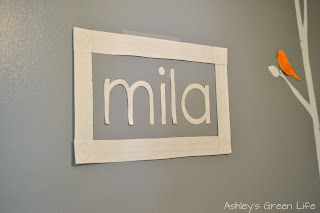 Based on the directions mentioned in the link above, they used wooden letters for the name, but since we had so much luck with the paper templates for the trees, we gave it a shot with the letters and it worked great (plus it was much cheaper!). So to do this we printed of a variety of fonts and sizes and then played around with the letters until we got them just right. Then we traced the letters and painted them onto the wall. 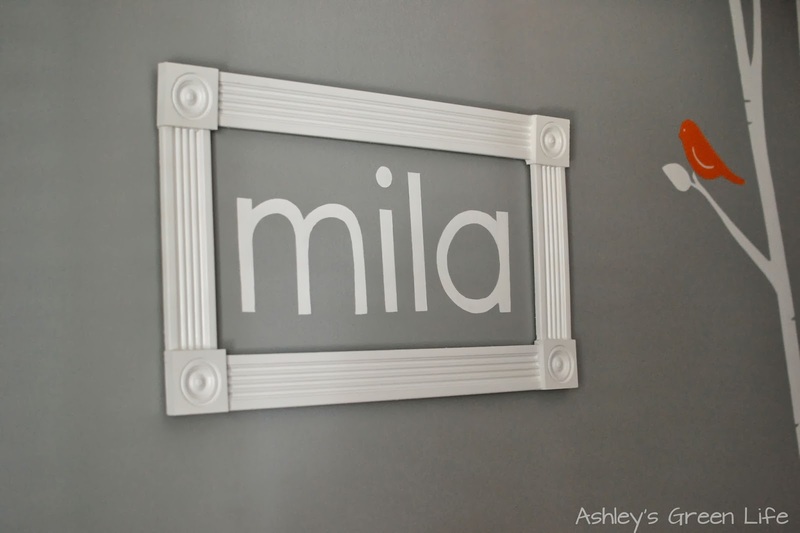 The paper template of her name and frame. 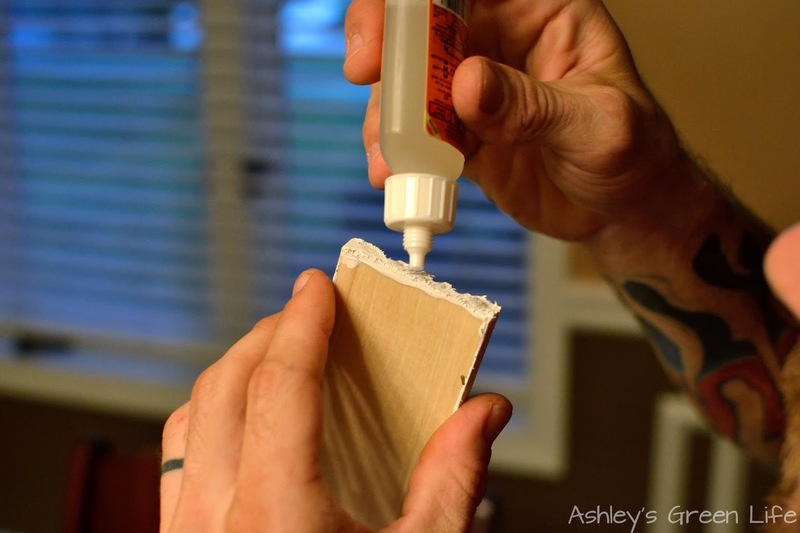 The next step was to create a frame based on the Pinterest-idea which used pieces of crown molding. 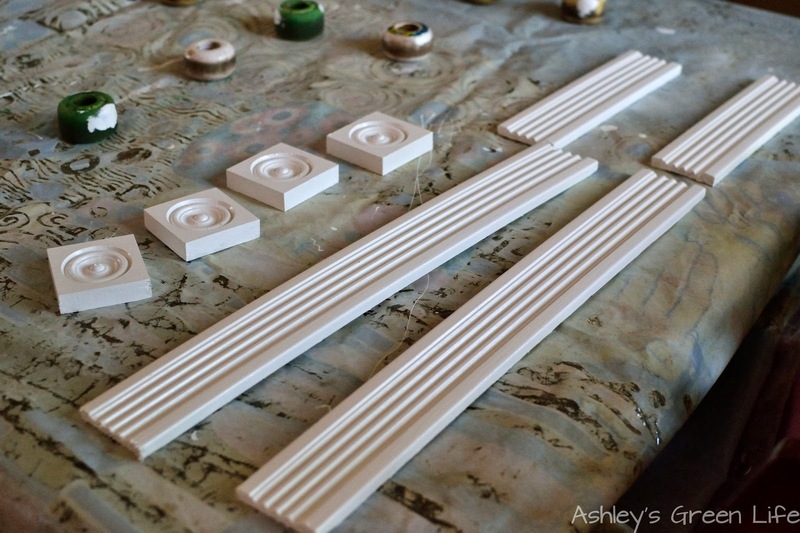 So with the measurements from our paper template frame, we headed to Lowe's and had pieces of crown molding cut to fit our frame and added some decorative corner pieces as well. 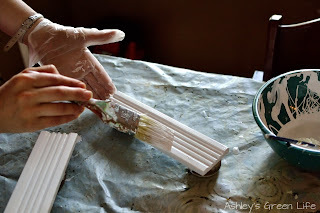 eco-friendly paint as you can remember from this post). 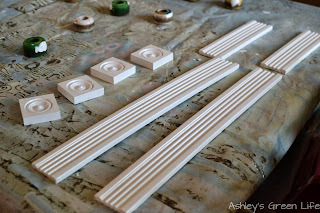 The painted pieces for the frame. Next we mounted it on the wall! 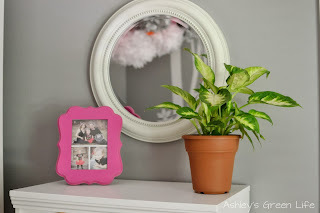 Nursery Project #3: Pom Pom Arrangement. If you've followed my blog for any period of time, you know I love pom poms! 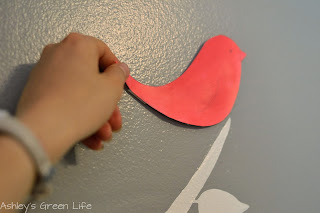 I use them to decorate for nearly every occasion and holiday (as you can see in Avery's first birthday, second birthday, and Mila's Gender reveal party). 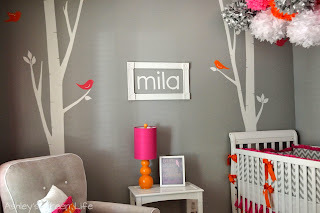 So the question of whether or not to include pom poms in Mila's room was a no brainer! Usually I like to make my own pom poms, but I found some great pre-cut grey and white ones online, as well as some pink and orange ones from Hobby Lobby and I think they made the arrangement turn out great! 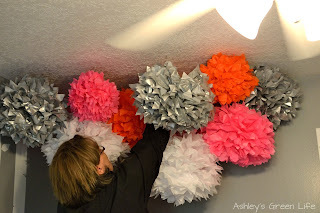 Now this idea seemed so easy on paper, but once we got all the pom poms puffed out and ready to hang, things got tricky. Basically we had a hard time deciding on the position of the pom poms, not only in height but in making sure there was an even distribution of colors. 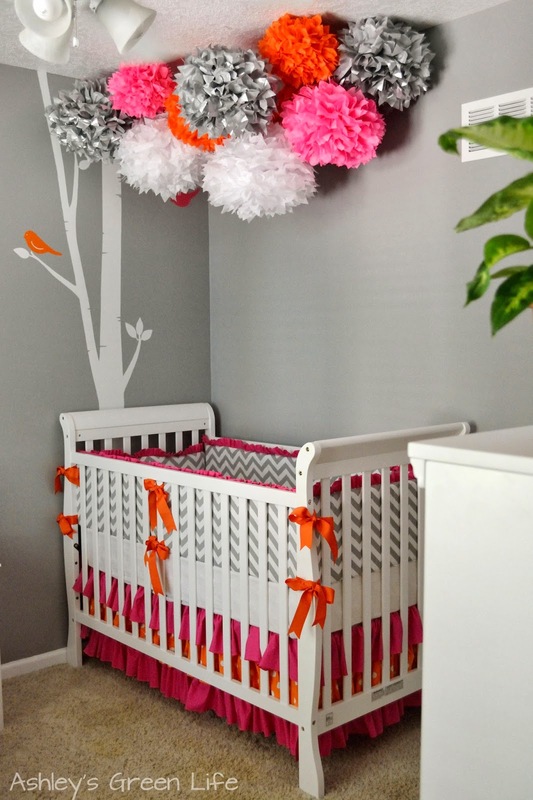 On top of that, the pom poms, which usually stay just fine with push pins, were not holding. 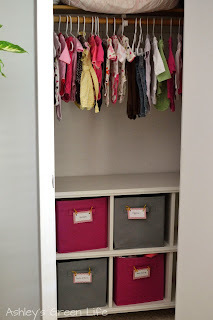 So we kept with the push pins but used a hot glue gun to adhere them to the ceiling. I know that seems pretty crazy to do, but the ceiling in that room has a little texture to it, so if they leave a little mark someday it will be okay. But after all the work of gluing, and taking down, arranging, and re-arranging,, the pom pom arrangement was finally complete and we love it! Nursery Project #4: Crib Bedding. 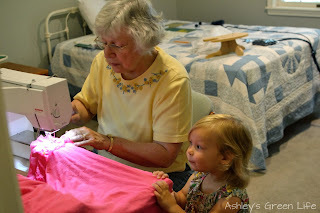 As much as I love to plan crib bedding, sewing is not my strong-suit, so I called on my mother-in-law Cheryl, who helped me with Avery's crib bedding, to work her sewing magic once again and help me create Mila's bedding. 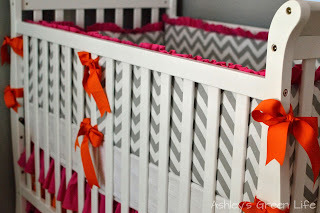 As you can see, I went with grey and white chevron bumper pads, with a pink ruffle top and orange ribbons. 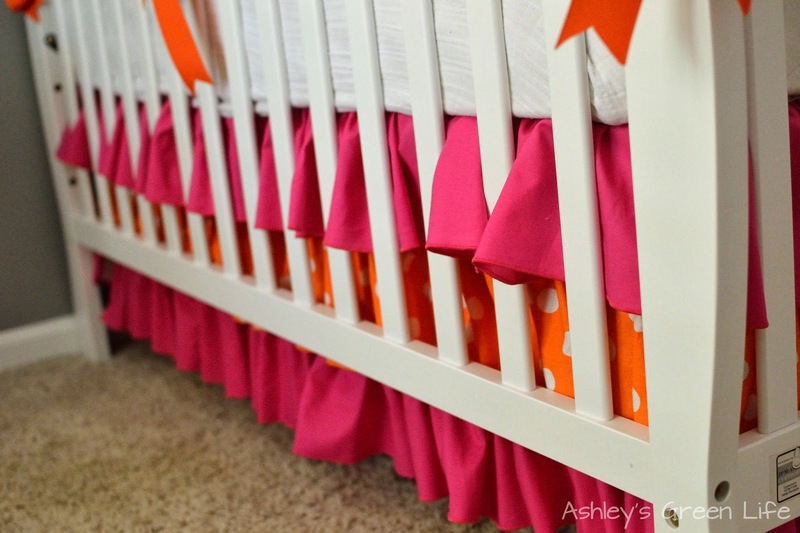 Next up was the crib skirt, which was comprised of three layers: pink fabric, polka dot orange fabric, and pink fabric again. 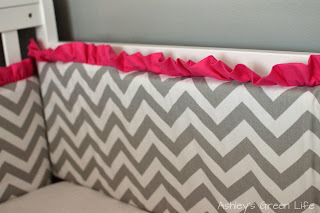 I got both of these fabrics from Hobby Lobby, but was unable to find a link to them. 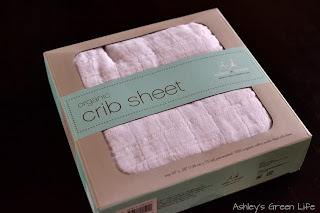 To wrap up the bedding, I went with a white organic crib sheet by aden & anais. When Avery was a baby, she loved the aden & anais muslin blankets, and so to have a crib sheet in the same material seems like the perfect thing! 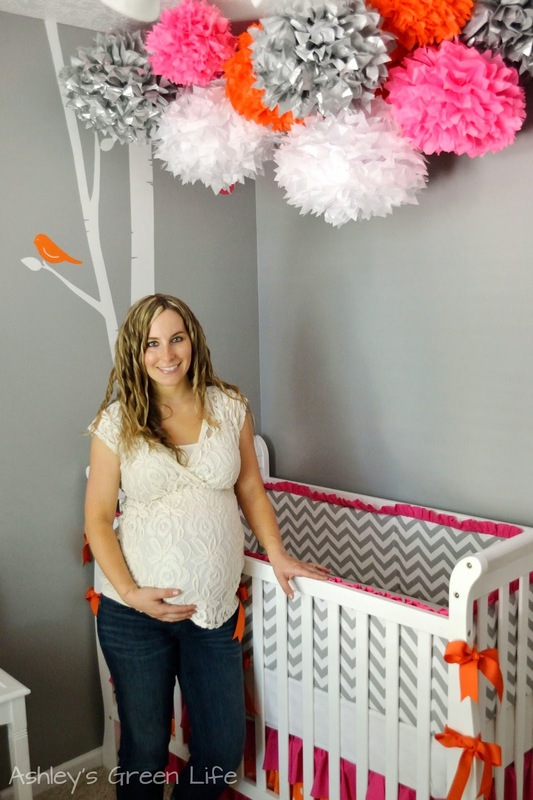 In case you're wondering, her crib is DaVinci Jamie 4-in-1 Convertible Crib in White and her mattress is DaVinci Sleepwell Willow Natural Coconut Palm Crib Mattress. Remember how I made sure to off-gas it in this post too? 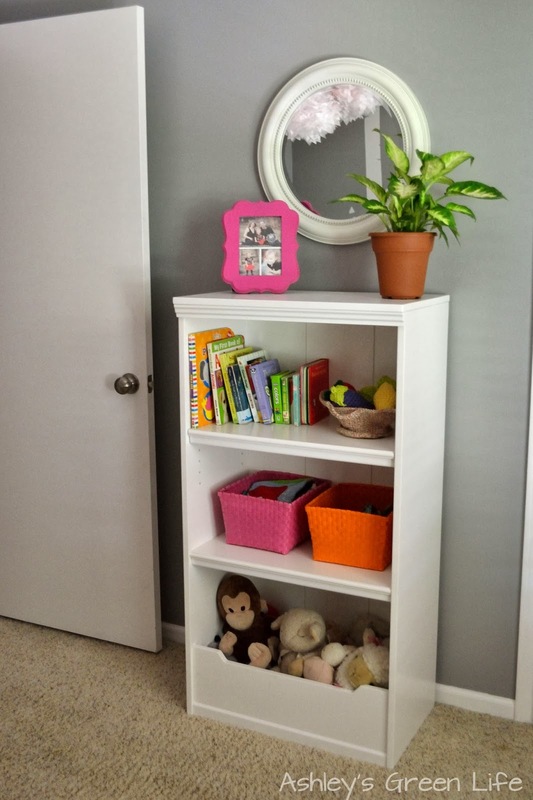 Nursery Project #5: Toy Shelf. Okay so it's probably weird to call a toy shelf a project, but to me, it was one more project to plan, create, and then cross of the list. 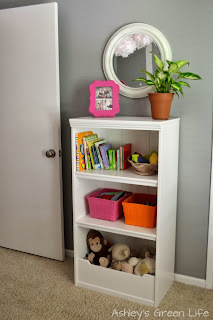 So essentially it consists of this cute Land of Nod 48" White Flat Top Bookcase, which I filled with books and toys (that Avery has temporarily let Mila borrow). On top of the bookcase is a pink frame from Hobby Lobby, a white circle mirror also from Hobby Lobby, and an indoor plant to help filter the air in her room. Nursery Project #6: Ruffle Curtains. 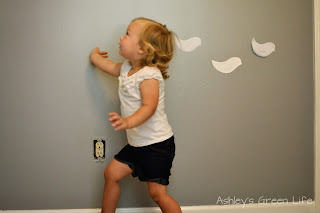 Ironically this is one of the first projects we did in the room after painting it grey (back in this post), mainly because the grey walls were looking pretty boring! So I knew a heavy hit of pink would do just the trick. 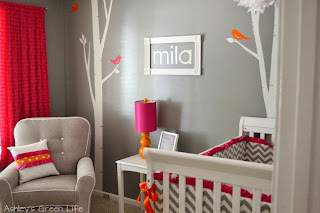 After seeing some cute ruffle fabric curtains on Pinterest, I knew that was the route I wanted to go with Mila's room, but they were pretty pricey. 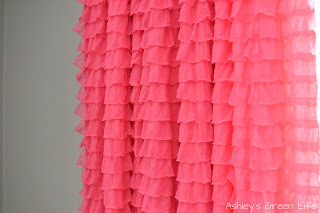 So I figured, why couldn't we just buy some ruffle fabric, trim it to the length we wanted, hem the edges and call it good? Luckily we were able to do just that (except it took a bit more work than that simple description). That's where my Grandma Sue comes in! 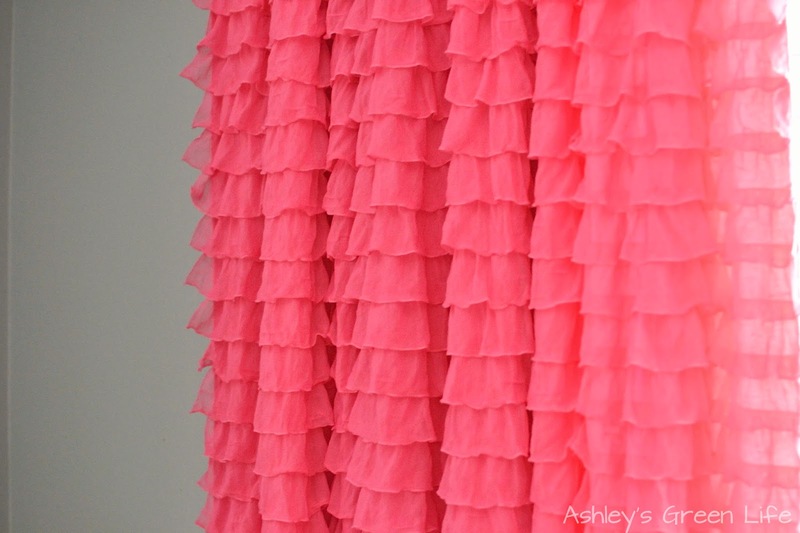 After purchasing this "Hot Pink 2 Inch Ruffle Fabric" online, she helped me trim and hem it to the right length and then we sewed a pocket at the top for the curtain rod. 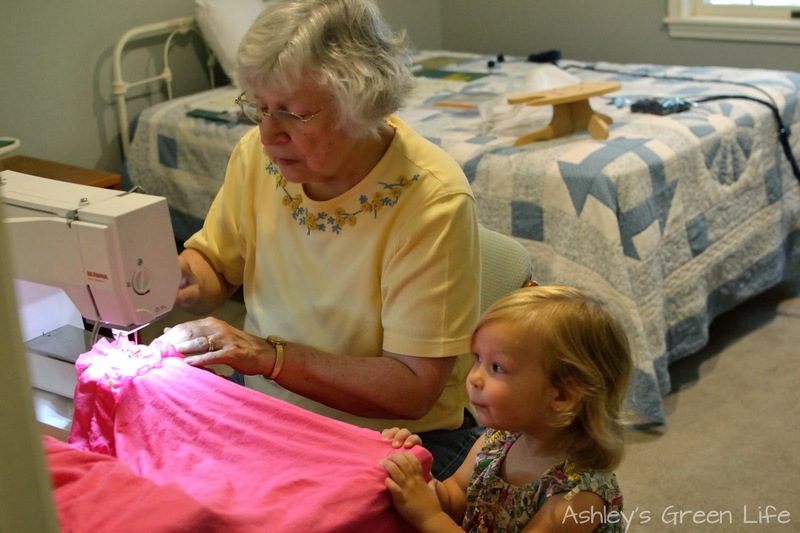 Here's Avery "helping" my Grandma sew the ruffle curtains. 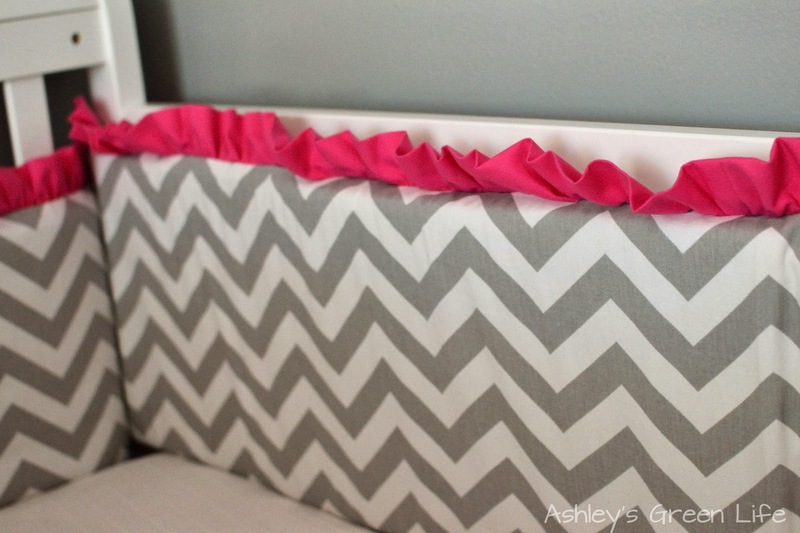 Not only do I love how they turned out, but they add a fun softness and texture to the room. I completed that corner of the room with a grey glider from Babies "R" Us and a custom pillow by my mother-in-law, with the leftover fabric from Mila's crib bedding. 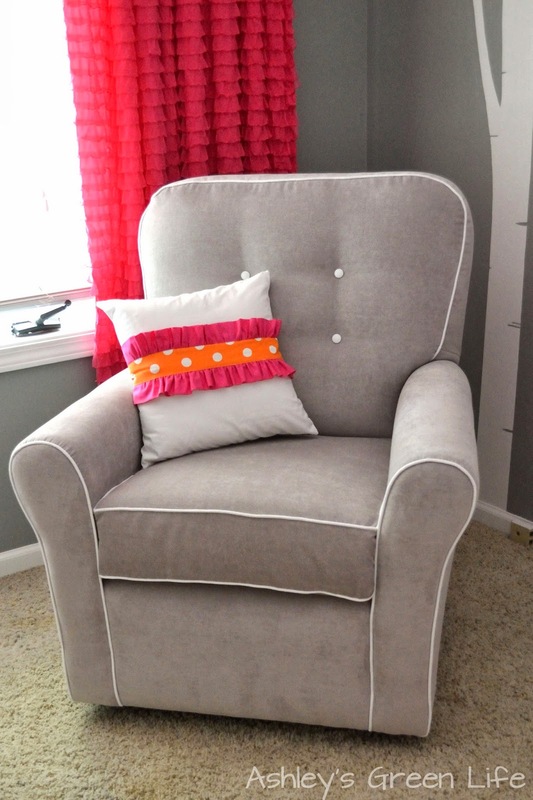 Next in that little nook is a small end table my mom was able to repurpose, as it used to be taller and black. 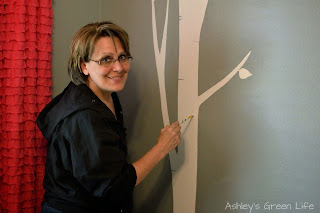 So she helped us paint it white, and Brandon cut it shorter. 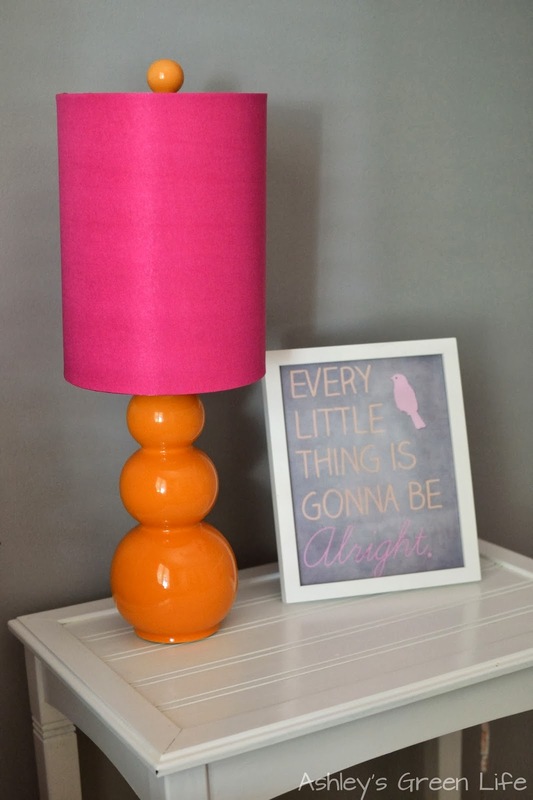 I topped it with this pink and orange lamp from Hobby Lobby and a framed quote I found on Pinterest. 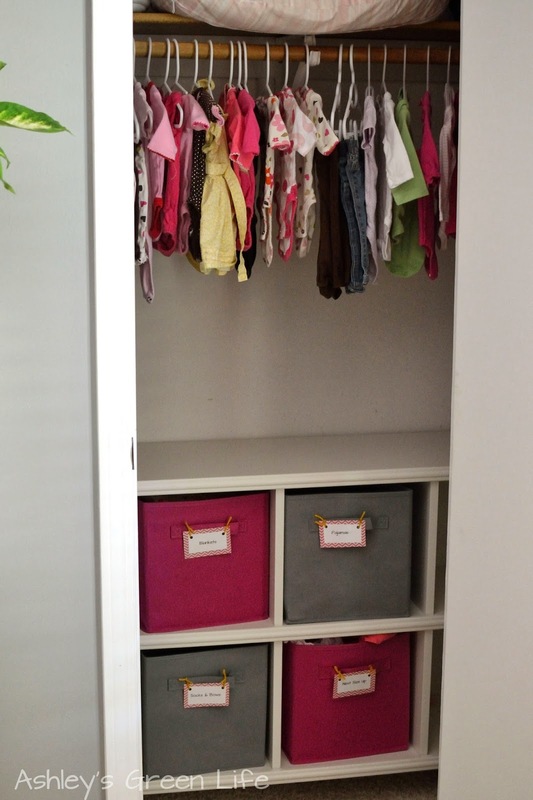 The last and probably least exciting area of the room is her closet which is full of her sister's hand-me-down clothes and some storage containers. So there you have it, Mila's grey, pink and orange nursery! I hope you enjoyed it, and be sure to post below if you have any questions about where I got something or how we made it. It's so exciting to think that in just a week or two...or three (who knows!) Mila will be here to enjoy this room of her's that we put so much work into. Let the memories begin! The room looks beautiful!! I love the color combinations and the wall decor. Mila is a lucky little girl in so many ways. :-) We are expecting #3 (1st boy), due 2 weeks after you and it's been fun following your journey! Our 2nd was born shortly after Avery and that's about when I found your blog (during our pregnancies in 2011). Good luck with this delivery, I am sure it will be amazing, what a blessing and a gift these sweet children are.